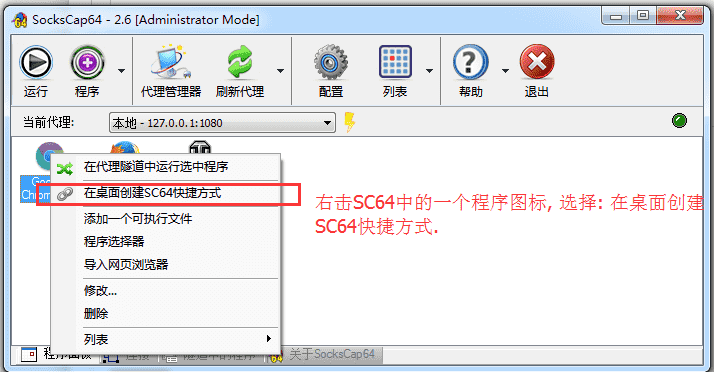 创建SC64快捷方式的方便之处就是: 之后退出SC64了, 又想要代理某个程序了, 不需要再次启动SC64然后再在SC64中启动目标的程序或者游戏, 而是直接在桌面通过SC64的快捷方式启动目标程序就可以了, 而SC64会在后台自动启动并提供服务, 大大的简化操作. Copyright © 2014 - 2019 SocksCap64, All Rights Reserved. Logos, Trademarks, Pictures Belongs To Their Respected Owners. Powered By WordPress. 56 Queries in 0.371 seconds.